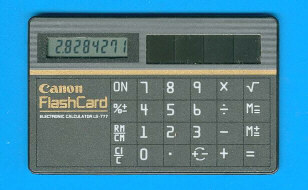 Size: 2.1" x 3.4" x 0.08"
Canon introduced with the LS-704 in 1984 a typical credit card sized calculator using solar cells instead the batteries. This LS-777 III sold almost 10 years later is just a slight variation of the original design. Don't miss the wonderful LS-718WC. © Joerg Woerner, November 23, 2008. No reprints without written permission.